In recent years, traditional banking models have been under serious pressure from digitisation. No matter how tried and tested agency models have been historically, there is little evidence to support their relevance in today’s marketplace. Digitisation, which brings with it a need for more automation and a better customer experience, has already transformed the retail banking landscape. Commercial banking has shown a slower uptake and there is less data available to understand the impact this disruption has had. Therefore, in conjunction with The Aite Group, we have gone out to asses the current state of the commercial card market in the United States. 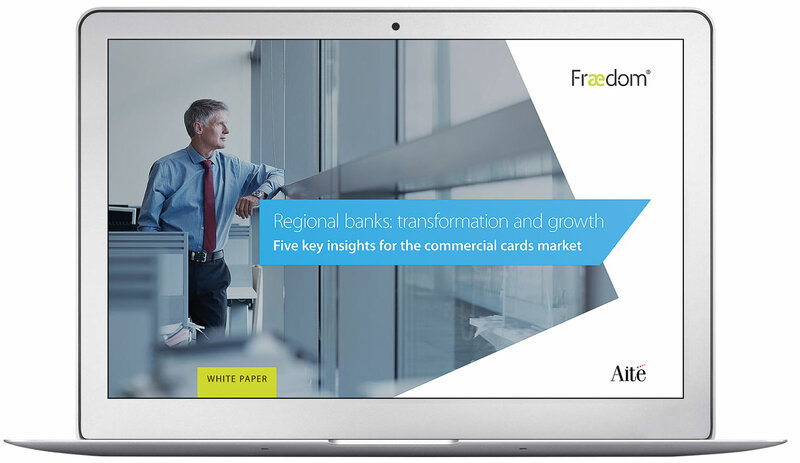 We have conducted a series of in-depth interviews with commercial card executives at regional and super-regional banks and presented our findings in this white paper. Explore the 2018 commercial card landscape: is the market in danger of being commoditised? There’s no denying the presence of virtual cards and e-payables: how is the market adapting to these trends? Customer experience is the latest competitive advantage: learn how banks are leveraging data to stay relevant and innovate. Rebates are a dying breed: see what banks are doing to replace this revenue stream. If you like what you see, get in touch with our experts today to discuss your business banking requirements.